Thank you to all of our generous donors during the 2018 Great Fish Challenge! The results are in! Our incredibly supportive community donated an impressive $20,025 to WAG during the 2018 Great Fish Challenge. Whitefish Animal Group (WAG) is one of fifty local nonprofits who participated in this year's challenge. The Challenge was established by the Whitefish Community Foundation to assist nonprofits in having one annual giving period and is maximized with a percentage match from the foundation. Thanks to our generous donors we reached our $20,000 fundraising goal which makes us one of 38 charities who raised more than $20,000, the maximum amount eligible to be matched. A total of $1,885,000 was donated, in total, to all 50 organizations, surpassing 2017's donations by more than $300,000. Additionally, the Whitefish Community Foundation will contribute a final match percentage to be awarded at its celebration on October 18th, 2018. A huge shout out of appreciation to everyone who supported this years fundraising efforts to enhance the lives of people, pups, and the community! We look forward to beginning the project and stay tuned for updates on the project. Our 2018 primary project was to add another entrance/exit to the park. Park patrons have shared with us that the single entrance/exit tends to get crowded which results in a stressful experience. Park visitation has grown tremendously since inception. Completion of this project will result in smoother transitions while entering and leaving the park. The architect's design (see above) include an "in and out" bullpen area with upgrade fence and gate(s). Additionally, landscaping will be added to improve aesthetics and function, along with clear signage. The entrance and exit will compliment the new paved parking lot and will be ADA accessible. The two bullpens were completed in mid October 2018, trees and landscaping will be added in the Spring of 2019. With our primary project complete, our secondary use of donor funds is to establish and maintain an Endowment Fund. 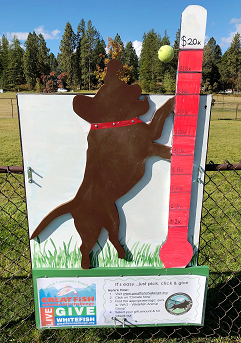 This fund will establish monies to maintain the dog park into perpetuity. We have always wanted to be able to have such a fund and this year’s challenge allowed us to begin that wish. We are proud to have $15,000 to start our endowment and will continue to grow this nest egg. Our 2017 North Field Project is complete! The North Field Project was a high priority on our "to do" list and it wasn't a small undertaking. The entire North Field area, including the obstacle course, did not have a sprinkling system so the area was unable to maintain grass during the summer season. In addition, due to its uneven surface the entire area accumulated water in the spring and during heavy rains. As a result the puddles attracted mud loving dogs...need I say more? This improvement was understandably the most requested park project from its users. We worked with River Design Group to come up with a solution to our mucky problem. This artists rendering above depicts the big picture on how to make that section more enjoyable for both canines and humans. The dogs will receive an improved agility course so they demonstrate their physical prowess. Fresh water will be regularly circulated in the dog pond and water levels more effectively managed. Certain areas will be regraded to significantly improve drainage. A portion of the water which is emptied from the pond will be used for irrigating the NW section rather than relying on city water. With the design and the capital in place it was time to get to work. Spear-headed by our fearless leader, Jim (aka Project Manager) the project was underway in September 2017. The above image showcases the creek-bed which is designed to divert excess water from the pond . The creek feature is not only functional but aesthetically pleasing. Everything went smoothly and we anticipate reopening this section in May/June. We are so excited to see how it looks in the warm season and will provide updates accordingly. Thanks again to the Whitefish Community Foundation and all of our donors for making this a reality! To donate please place a cash or check in the red donation box located at the park. You can also mail a check to the address below or select the "Donate" button located at the top of the page.